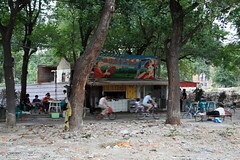 Between meals during my first and only visit to Beijing, in 2006, I spent many hours on unescorted walks far from the tourist attractions. Typically this was occasion to sample still more food, but it was also an opportunity to wander through many out-of-the-way neighborhoods before their charm and their grit was swept clean by urban redevelopment. Sadly, only my camera, and not my belly, had room for The Restaurant of Uygur (shown) on the day I passed by; by the looks of the surroundings, it's likely I missed my one opportunity. See a few more fleeting sights in this slideshow.